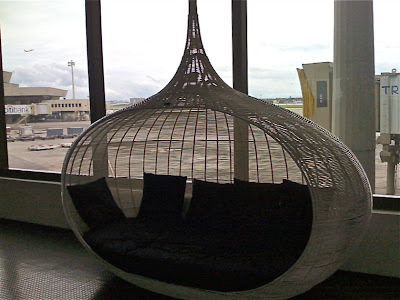 yesterday afternoon when we arrived from bangkok, got off the plane, and entered NAIA, this is the first thing that we saw: what is this chair doing here? is it a kenneth cobonpue? is it for passengers to sit on and relax (after sitting out a three-hour or more flight) before heading to immigration? or did someone leave it behind? are we allowed to sit on it? or lie in it? it's super cute. and it looks a lot like chuvaness's new onion couch. hey chuva we found the missing chair from your sala set!